For other uses, see Suzuki (disambiguation). Suzuki Motor Corporation (スズキ株式会社, Suzuki Kabushikigaisha) is a Japanese multinational corporation that specializes in manufacturing compact automobiles, a full range of motorcycles, All-Terrain Vehicles (ATVs), outboard marine engines, motorized wheelchairs and a variety of other small internal combustion engines. Suzuki is the twelfth largest automobile manufacturer in the world, employs over 45,000 people, and maintains 35 main production facilities in 23 countries and 133 distributors in 192 countries. Suzuki, begun in 1909 as a manufacturer of wooden looms, has been characterized throughout its history by flexibility, innovative thinking, and the ability to anticipate the needs of its customers. 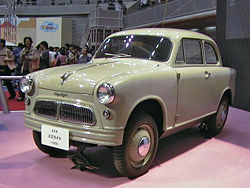 Its first automobile, the Suzulight, released in 1951, pioneered the Japanese small car concept. Suzuki’s motorcycles began winning championships in 1953. In the United States, Suzuki introduced the first ATV (All-Terrain-Vehicle), the first compact 4-door SUV, and the first 100,000/7-year powertrain limited warranty. Maruti Suzuki, formed in partnership with the government of India to produce an economical passenger car for the middle class, is now Suzuki's largest and most valuable division. Between 1973 and 2000, Suzuki launched dozens of overseas subsidiaries, in response to the demand for affordable transportation. In response to environmental concerns, which can seriously affect the future of humanity, Suzuki is committed to the conservation of natural resources, both in its products and its manufacturing facilities. Suzuki has achieved “Zero-landfill” status, meaning that nothing from their manufacturing process is thrown away in a landfill. All the by-products of its manufacturing processes are treated, re-cycled or re-used. "Suzuki" is pronounced in Japanese as "soo-zoo-kee" /suzuki/, with emphasis on a high "kee." It is often mistakenly pronounced in English as "suh-ZOO-kee" /səˈzuːki/, with a stressed "zoo." This pronunciation is used by the English-speaking public and by the Suzuki company in marketing campaigns directed at this demographic. Michio Suzuki, the founder of Suzuki, was born the son of a cotton farmer in 1887 in Hamamatsu, a small seacoast village about 120 miles from Tokyo, Japan, in a region renowned for its textiles and woodworking. Suzuki learned carpentry, and in 1909, he founded the Suzuki Loom Company to build innovative, pedal-driven wooden weaving looms for Japan's silk industry. Suzuki's goal was to build better, more efficient looms, and the business expanded. In March of 1920, Suzuki Loom Manufacturing Company (Suzuki Jidosha Kogyo) was registered on the Tokyo Stock Exchange. In 1922, Suzuki Jidosha Kogyo was one of the largest loom manufacturers in Japan. In 1929, Michio Suzuki invented a new type of weaving machine, which was exported to India and Southeast Asia. Suzuki filed as many as 120 patents and utility model rights, and for its first 30 years, the company concentrated on the development and production of these exceptionally complex machines. Suzuki realized that the market for looms was limited, and that his company needed to diversify. At that time Japan was importing 20,000 automobiles annually, and Suzuki determined that the most practical new venture would be building a small car. The project began in 1937, when the Suzuki research team dismantled a British Austin Seven; within two years Suzuki had completed several compact prototype cars. These first Suzuki motor vehicles were powered by a then-innovative, liquid-cooled, four-stroke, four-cylinder engine, featuring a cast aluminum crankcase and gearbox and generating 13 horsepower from a displacement of less than 800 cubic centimeters. At the beginning of World War II, the government declared civilian passenger cars a "non-essential commodity," and production plans for Suzuki's new vehicles were halted. At the conclusion of the war, Suzuki went back to producing looms. The production of looms increased dramatically when the United States government approved the shipping of cotton to Japan, and orders began to increase from domestic textile manufacturers. The collapse of the cotton market in 1951, however, all but eliminated the demand for looms. Suzuki's thoughts went back to motor vehicles. After the war, the Japanese people needed affordable, reliable personal transportation. A number of firms began manufacturing "clip-on" gas-powered engines that could be attached to an ordinary bicycle. Michio Suzuki’s son, Shunzo Suzuki, designed an engine for the ingenious Power Free, a motorized bicycle designed to be inexpensive and simple to build and maintain. The Power Free featured a square 36 cc two-stroke engine. An innovative feature was a double-sprocket gear system that allowed the rider to either pedal with the engine assisting, pedal without help from the engine, or simply disconnect the pedals and run on engine power alone. The system was so ingenious that the patent office of the new Japanese government granted Suzuki a financial subsidy to continue research in motorcycle engineering. Following the success of its motorcycles, including the Colleda (1955), Suzuki produced Japan’s first light automobile, the 1955 Suzulight. From the beginning, Suzuki showcased its penchant for innovation. The Suzulight included front-wheel drive, four-wheel independent suspension, and rack-and-pinion steering; features that did not become common on other automobiles until half a century later. In 1961, the loom machine division was separated from the motor works as “Suzuki Loom Manufacturing Company.” A lightweight truck, the 'Suzulight Carry' was launched. In 1963, Suzuki opened its first overseas subsidiary, U.S. Suzuki Motor Corp., in Los Angeles. Over the next two decades, this was followed by the rapid expansion of sales and production into many parts of the world. In 1974, Suzuki entered the medical field with the Suzuki Motor Chair Z600 motorized wheelchair, and the housing market with two models of prefab 'Mini-House' and three types of storage sheds. In 1980, Suzuki began to produce and market electric generators. In 1981, Suzuki entered to the first of numerous collaborations with other vehicle manufacturers, signing agreements with General Motors (U.S.) and Isuzu Motors, Ltd.(Japan). In 1990, its corporate name changed to Suzuki Motor Corporation. In 1997, Suzuki achieved cumulative automobile sales of 10 million in the overseas market, and its 4-stroke outboard motors win the Innovation Award at the International Marine Trade Exhibit and Conference (IMTEC) in Chicago. In 1999, Suzuki’s aggregate production of motorcycles reached 40 million units. In 2002, Suzuki accomplished cumulative sales of 30 million automobiles in the worldwide market. In 2003, Suzuki celebrated 30 consecutive years as the leader for keicar (small cars) sales in Japan. In 2004, its aggregate automobile sales in Japan reached 15 million units. In 2006, General Motors divested its interest in Suzuki, selling 92.36 million shares and reducing its stake to 3 percent. Suzuki’s objective, as stated by the company’s third president, Jitsujiro Suzuki, is to build "value-packed products" that meet customer's needs at a reasonable price. Suzuki’s global expansion has been driven both by an understanding of the differing transportation needs of Europe, North America, and developing economies, and by a quest for low-cost manufacturing. In 1967, Thai Suzuki Motor Co., Ltd. was established as a local assembly plant. Suzuki opened Suzuki Canada Ltd. in 1973; P.T. Suzuki Indonesia in Jakarta in 1974; Antonio Suzuki Corporation, a joint venture for knockdown production and sales, in Manila, the Philippines, in 1975; sales and marketing in the U.K. in 1979; Suzuki Australia Pty. Ltd. in 1980; production facilities at PAK Suzuki Motor Co., Ltd. in Karachi, Pakistan in 1982; |Maruti Udyog Ltd.]] in New Delhi, India in 1983; Suzuki New Zealand Ltd. and Suzuki Motor GmbH Deutschland in 1984; motorcycle production in Spain in 1985; production facilities in Colombia in 1987; collaborative production with Daewoo Shipbuilding & Heavy Machinery Ltd in Korea in 1991; Suzuki Egypt S.A.E and Magyar Suzuki Corp. in 1993; and production in Vietnam in 1996. In 1998, Chongqing Chang'an Suzuki Automobile Co., Ltd. received official approval from the Chinese government for production of passenger cars, and in 1999, Jiangxi Changhe Suzuki Automobile Co., Ltd. received approval for production of commercial vehicles. 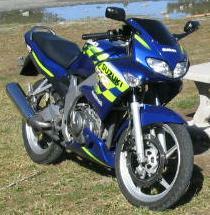 In 1998, Suzuki formed an alliance with General Motors, and in 2000, production began at General Motors de Argentina S.A.. In 1963, U.S. Suzuki Motor Corporation, a direct sales subsidiary, opened in Los Angeles and began selling its line of inexpensive, lightweight motorcycles in the United States. In 1983, the company introduced the first four-wheeled all-terrain vehicle (ATV), the QuadRunner LT125. In 1985, through an agreement with General Motors, Suzuki began selling a version of their Suzuki Cultus in United States as the Chevrolet Sprint. Initially sold as a 3-door hatchback, it was Chevrolet's smallest model. The same year, the newly created American Suzuki Corporation introduced the Suzuki Samurai, available as a convertible or hardtop, in the United States. It set a record for the number of cars sold by a Japanese automaker during its first year in the United States. In 1989, American Suzuki introduced the Swift, a second-generation Suzuki Cultus available as a GTi and GLX hatchback; and the four-door Suzuki Sidekick, the first 4-door mini-SUV in North America. The Swift and Sidekick were mostly produced in Ingersoll, Canada by a joint venture between Suzuki and GM, CAMI. The Swift GT/GTi and 4-door models were imported from Japan. Suzuki’s four-wheel-drive SUVs were immediately popular with Americans who wanted a tough, sporty vehicle. In 1995, American Suzuki introduced the Suzuki Esteem and redesigned the Swift, the first Suzuki vehicles to be marketed in North America with dual front airbags. 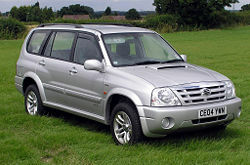 In 2001, Suzuki's largest vehicle to date, the Grand Vitara XL-7 was the first compact SUV to offer 3-row seating. In 2004, General Motors(GM) and Suzuki jointly purchased the bankrupt Daewoo Motors renaming the venture GMDAT. American Suzuki rebadged the compact Daewoo Nubira/Daewoo Lacetti as the Forenza and the mid-size Daewoo Magnus as the Verona. In 2006, American Suzuki’s sales in the United States surpassed 100,000 vehicles for the first time. Suzuki redesigned the Grand Vitara in 2006, and in 2007, introduced the Suzuki SX4, produced as a joint venture with Fiat S.p.A., and the Suzuki XL7, a collaboration with GM produced at CAMI Automotive Inc. in Ingersoll, Ontario, Canada. American Suzuki headquarters is located in Brea, California. On June 1, 1973, Suzuki Canada Ltd. was incorporated with its offices at Downsview, Ontario, to supply motorcycles, parts and accessories to Suzuki dealers throughout Canada. In 1980, Suzuki Canada began its automotive sales with the marketing and sales of four-wheel-drive Suzuki LJ80 in eastern Canada. In November 1980, the name of the company changed from Suzuki Canada Ltd. to Suzuki Canada Inc.. Suzuki introduced its all-terrain vehicles (ATVs) in Canada in 1982, and its outboard motors in 1983. Sales of the Suzuki Forsa (Suzuki Cultus) automobile began in 1984. In 1986, Suzuki announced a $600 million joint venture with General Motors, CAMI Automotive Inc. to manufacture vehicles at a plant in Ingersoll, Ontario. January of 1987, Suzuki Canada Inc. moved to a new 110,000 sq ft (10,000 m²). head office and warehouse facility at Richmond Hill, Ontario. 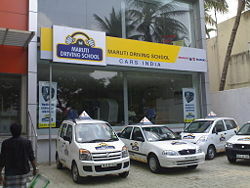 Maruti Driving School in Tamil Nadu. Based in Gurgaon, India, Maruti Suzuki India Limited is Suzuki's largest and most valuable subsidiary with an annual production of 626,071 units in 2006. Suzuki has a 54.2% stake in the Indian auto giant and the rest is owned by the various Indian public and financial institutions. The company was incorporated in 1981 and is listed on the Bombay Stock Exchange and National Stock Exchange of India. In 2005-2006, the company had a 54 percent market share of the passenger car market in India. Nearly 75,000 people are employed directly by Maruti and its partners. Maruti Suzuki was born as a Government of India company, with Suzuki as a minor partner, to produce an economical passenger car for middle-class India. Over the years, the product range has widened, ownership has changed hands and the customer has evolved. Maruti Suzuki offers 10 models, ranging from India's best selling car, Maruti Suzuki 800, for less than INR 200,000 (US$ 5000) to the premium sedan Maruti Suzuki SX4 and luxury SUV, Maruti Suzuki Grand Vitara. The first model, the Maruti 800, was launched by the company in 1983 followed by a mini-van, Maruti Omni, in 1984. Both models became popular because of their advanced technology and fuel efficiency. Maruti Gypsy, launched in 1985, became the vehicle of choice for the Indian Army and Indian Police Service. The short-lived Maruti 1000 achieved moderate success, until it was replaced by Maruti Esteem in 1994, to counter increasing competition in the medium-sedan category. Maruti Zen, the company's second compact car model, was launched in 1993, was also a success in India because of its high performance. Another compact car, Maruti Wagon-R, was launched, followed by Maruti Baleno in 1999. These two models faced increasing competition from Tata, Hyundai, Honda and Daewoo Motors, so Maruti Suzuki Baleno was replaced with the Suzuki SX4, and the Wagon-R with Suzuki Splash. Today, the SX4 is the best-selling car in its market segment. The Maruti Alto, launched in 2000, helped to secure Maruti’s position as the leading automobile manufacturer in India, and is currently the best-selling car in India. Maruti models include Maruti Suzuki Grand Vitara, launched in 2003; Maruti Versa, launched in 2004; Maruti Suzuki Swift, launched in 2005; Maruti Zen Estilo and Maruti Suzuki SX4, launched in 2007; and the Maruti Suzuki Liana sedan, launched in 2008. Maruti Exports Limited, a subsidiary of Maruti Udyog Limited, concentrates entirely on exports and does not operate in the domestic Indian market. Its first commercial consignment of 480 cars was sent to Hungary; since then, 280,000 automobiles have been exported. Over 60 percent of these exports have gone to Europe; the top ten destinations have been Netherlands, Italy, United Kingdom, Germany, Algeria, Chile, Hungary, Sri Lanka, Nepal and Denmark. Maruti has also entered some unconventional markets such as Angola, Benin, Djibouti , Ethiopia, Morocco , Uganda, Egypt, Chile, Costa Rica, and El Salvador. Maruti Exports Limited has helped the government of India achieve its objective of increasing exports in order to earn foreign currency. Following the terms of the Joint Venture Agreement between Suzuki Motor Corporation of Japan (SMC) and Pakistan Automobile Corporation (PACO), Pak Suzuki Motor Company Limited (PSMCL) was incorporated as a public limited company in August 1983. The new company assumed the assets, including production facilities ,of Awami Autos Limited, and began commercial operations in January 1984 with the primary objective of manufacturing passenger cars, pick ups, vans and 4x4 vehicles. The groundbreaking ceremony of the company’s green field automobile plant at Bin Qasim was performed by the then prime Minister of Pakistan in early 1989. Early in 1990, this plant started in-house assembly Suzuki engines. In 1992, Suzuki production was transferred to a new plant and the 1300 cc Margalla car went into production. In September, 1992, the company was privatized and placed directly under Japanese management. At the time of privatization, SMC increased its equity from 25% to 40%, and by December 31, 2001, had increased its equity to 73.09%. In July, 1994, the Bin Qasim Plant, the most modern automobile manufacturing plant in Pakistan, expanded its production capacity to 50,000 vehicles per year. in July 1994 and 3,00,000 vehicles had been manufactured at this plant by December 2003. One of Suzuki’s central objectives is to provide its customers with “value-packed products.” The company has recognized that the meaning of “value” differs according to country, lifestyle and degree of economic development, and has demonstrated imagination and creativity in developing technologies and products that satisfy the needs of customers in many parts of the world. The 'Suzulight' (1959) pioneered the design of lightweight cars that fueled Japan's automotive revolution. In 2003, Suzuki launched the first hybrid keicar (small car) in Japan, the Suzuki Twin. In India, Suzuki developed a series of general-use vehicles for the rapidly-expanding middle class. For racing enthusiasts, Suzuki has designed a range of advanced street, off-road and championship racing machines. In North America, Suzuki introduced the first four-wheeled all-terrain vehicle (ATV), the QuadRunner LT125; the first 4-door mini-SUV, the Suzuki Sidekick; and the first compact SUV to offer 3-row seating (Grand Vitara XL-7). All of these concepts have taken hold and developed into major markets. In 2002, Suzuki also introduced "America's #1 warranty," a 100,000/7-year powertrain limited warranty, a concept that was soon emulated by other major car manufacturers. The XL7 (2007), the first Suzuki designed exclusively for the North American market, delivers added luxury and performance with a standard 252-horsepower V-6 engine and extras such as 7-passenger seating, all-wheel drive, a rear seat DVD entertainment system and touch-screen navigation. Suzuki has also demonstrated flexibility and originality in adapting its technologies to other fields, producing motorized wheelchairs, outboard motors, generators, and pre-fabricated buildings and storage sheds. Suzuki has a public commitment to contribute to the economy and community life of the countries where its products are manufactured and sold. Suzuki started manufacturing motorized bicycles in 1952. During the 1950s, 1960s, and the better part of the 1970s, the company manufactured only motorcycles with two-stroke engines. The biggest two-stroke model was the water-cooled triple-cylinder Suzuki GT 750. Suzuki's success in two-stroke competition can be attributed to the East German Grand Prix racer Ernst Degner, who defected to the West in 1961, bringing with him expertise in two-stroke engines from the East German manufacturer MZ Motorrad- und Zweiradwerk. Suzuki hired Degner, and he won the 50 cc F.I.M. road racing World Championship in 1962. Suzuki became the first Japanese manufacturer to win a motocross world championship when Joel Robert won the 1970 250 cc title. During the 1970s, Suzuki established themselves in the motorcycle racing world with the world championship wins of Barry Sheene in the premier 500 cc division in road racing, and Roger De Coster in motocross. In 1976, Suzuki introduced its first motorcycles with four-stroke engines, the Suzuki GS400 and GS750. Since then, Suzuki has established a reputation as a manufacturer of well-engineered sport motorcycles. Today, Suzuki ranks as one of the world's "Big Four" motorcycle manufacturers, delivering a range of advanced street, off-road and championship racing machines. In 1994, Suzuki partnered with Nanjing Jincheng Machinery to create a Chinese motorcycle manufacturer and exporter called Jincheng Suzuki. Suzuki continues to compete in MotoGP and last won the title in 2000. Since 2006, the team has been sponsored by Rizla and is known as Rizla Suzuki MotoGP team. 1952 - 'Power Free' motorized bicycle launched. 1955 - Lightweight car Suzuli ght(360 cc, 2-stroke) launched, helping to introduce the concept of Japan's light-weight cars. 1961 - Suzuki Loom Manufacturing Co. established by separating the loom machine division from the motor works; lightweight truck Suzulight Carry released. 1965 - 'D55' (5.5 hp, 2-stroke) outboard motor marketed successfully;Suzuki Fronte 800 marketed. 1968 - Suzuki Carry full-cab van released. 1970 - LJ-Series 4X4 released. 1971 - GT750 motorcycle released. 1974 - P.T. Suzuki Indonesia Manufacturing established in Jakarta, Indonesia, entry into medical equipment field by releasing the Suzuki Motor Chair Z600 motorized wheelchair, expansion into the housing field initiated with Suzuki Home marketing two models of prefab 'Mini-House' and three types of storage sheds. 1976 - GS-Series motorcycles released. 1977 - LJ80 4x4 vehicle released and exports of GS1000H motorcycle begin. 1979 - SC100 released in the UK. 1980 - Suzuki Australia Pty. Ltd. established in Sydney, Australia; entry into general purpose engine field with the launch of three electric power generator models. 1982 - 4X4 production begins at PAK Suzuki Motor Co., Ltd. in Karachi, Pakistan; wins maker championship for seventh consecutive year at the World Road Race Grand Prix 500. 1982 - SC100 Discontinued in favor of Alto. 1984 - Suzuki New Zealand Ltd. established in Wanganui, New Zealand and begins export of Chevrolet Sprint to the United States. Car production technical assistance contract signed with China National Aerotechnology Import & Export Beijing Corporation. Operation of Suzuki Motor GmbH Deutschland began in Heppenheim,Germany. 1986 - American Suzuki Motor Corp. is formed by the merger of U.S. Suzuki Motor Corp and Suzuki of America Automotive Corp.
1987 - Cultus/Swift production began in Colombia and total aggregate car exports reached two million units. 1991 - Car production starts in Korea through technical ties with Daewoo Shipbuilding & Heavy Machinery Ltd and Cappuccino 2-seater marketed. 1993 - Passenger car production/sales begins at Suzuki Egypt S.A.E., opening ceremony for new car production plant held at Magyar Suzuki Corp. in Esztergom, Hungary and Wagon R passenger car released. 1994 - Maruti Udyog Ltd. of India total aggregate car production reaches 1 million units. 1997 - Achieves 1ten million cumulative automobile sales for overseas market and 4-stroke outboard motors win the Innovation Award at The International Marine Trade Exhibit and Conference (IMTEC) in Chicago. 2002 - Achieves 30 million cumulative automobile sales for worldwide market; launches America's number one warranty: 100,000/7-year powertrain limited warranty. 2003 - Suzuki is number one in Keicar sales for the thirtieth consecutive year and Twin, the first hybrid Keicar in Japan, marketed. 2005 - Swift awarded the 2006 RJC Car of the Year. 2006 - New Suzuki XL7 is marketed particularly to the North American market; GM divests, selling 92.36 million shares and reducing itsS stake to 3%. 2008 - Suzuki introduces its first production fuel-injected motocross bike. ↑ Suzuki Cycles History of Suzuki Cycles Retrieved July 7, 2008. ↑ Suzuki Auto Suzuki History, About Suzuki. Retrieved July 7, 2008. ↑ OICA World Motor Vehicle Production International Organization of Motor Vehicle Manufacturers Retrieved July 8, 2008. ↑ About Us Maruti Suzuki. Retrieved July 8, 2008. ↑ On February, 14, 2008, Maruti Suzuki India announced that it had achieved one million total accumulated production volume of the Alto. The Alto reached the million units mark just seven years and five months after its launch in September, 2000. The last half of the million had come in a record 25 months. The Alto was India's largest volume-selling car, every month, for 37 consecutive months. The Alto is the third Maruti Suzuki car to cross the million units mark, after the Maruti 800 and the Omni. Over 152,000 Altos made at Maruti Suzuki were delivered internationally, becoming especially popular in Algeria and Chile. ↑ Official website of Maruti Exports Limited. Retrieved July 8, 2008. ↑ Official Web site of the Pak Suzuki Motor Company Limited Retrieved July 8, 2008. ↑ Suzuki Environmental Responsibility Suzuki official Web site. Retrieved July 8, 2008. This page was last modified on 6 November 2015, at 23:47.